Last week Steve and I decided to change out the chandelier in our oh so tiny 1st floor bathroom (I'm not kidding - It's more like the size of a locker than a powder room). Like most of the cosmetic updates in this old house, it became a weekend warrior project. The electrician had to cut some holes in the wall in order to run the wire up to the ceiling so the wall had to be repaired and re-painted. 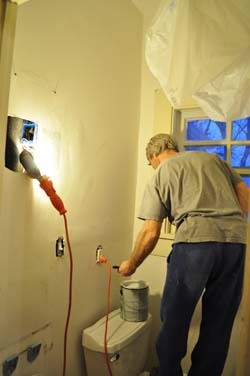 Which meant that the sink had to be taken out so we could paint the entire wall. 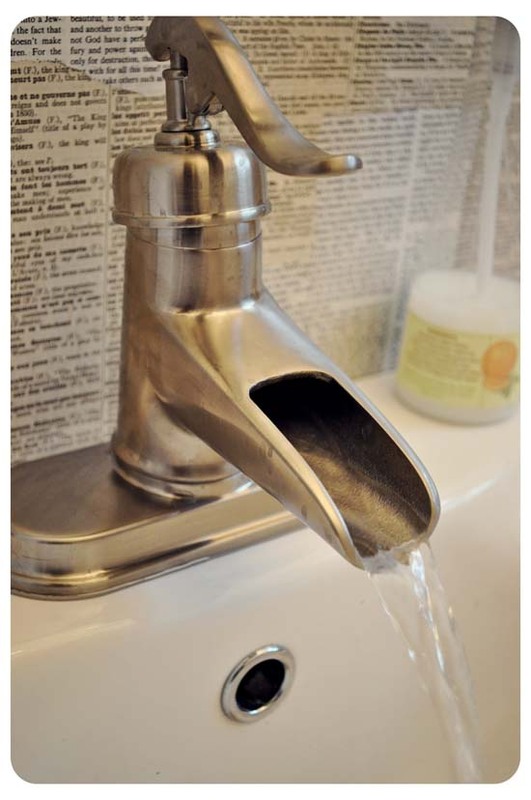 And that, somehow, meant that we needed a new faucet. We also got a new toilet seat but that just isn't something photo-worthy. (We obviously can't be trusted in the hardware store unsupervised). And because we are the kind of twisted people that apparently enjoy even more work, we took some inspiration from Rebecca and covered the walls in old book and Bible pages. We used a universal wallpaper paste to adhere the pages and, so that they can be wiped down if needed, we applied three layers of clear coat on top. Note: when I say "we", I mean Steve. He did a ton of work and totally deserves all the credit! 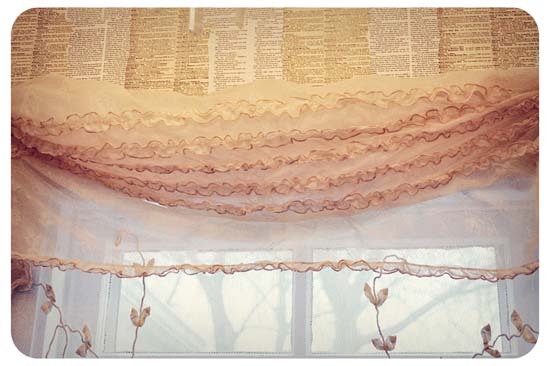 My contribution was some ruffles and lace for the windows. Oddly, adding the pages to the walls doesn't make the room look any smaller. It turned out so beautiful that the kids are calling it the "hotel bathroom". And on the plus side, it's a great place for kids to read Bible verses. After all, they're a captive audience. And the Bible says that we should take every opportunity to teach our children God's Word. Almost sounds like we planned it this way. Yeeeaaah, that's what I'm going to tell everyone anyhow. And these words which I command you today shall be in your heart. You shall teach them diligently to your children, and shall talk of them when you sit in your house, when you walk by the way, when you lie down, and when you rise up... You shall write them on the doorposts of your house and on your gates. I love what you...(STEVE) did the bathroom...omgosh, the walls are genius. Just genius. 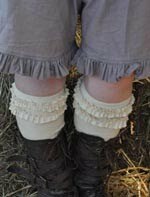 And, the ruffle curtains are so girly and work perfectly perfect with the look. It's a sweet bathroom...not to mention your children get reading material. Great job. 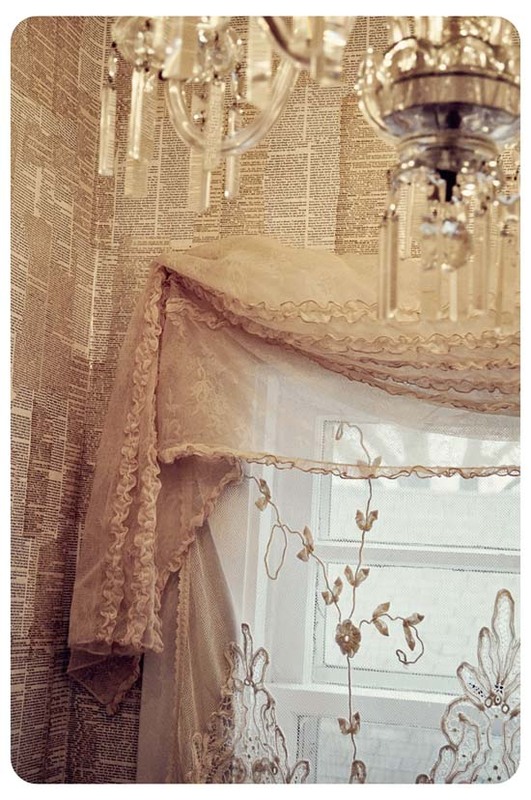 Amazing I LOVE IT.I remember reading that on Rebecca's blog.Looks amazing in your powder room too.I would love to get the courage to do that.That curtain looks lovely there too.Wow and that chandy I am envious.I would love some bling in any of our powder rooms. 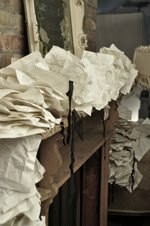 What a fabulous idea... wallpapering with bible pages of all things! I agree...you couldn't have a more captive audience. 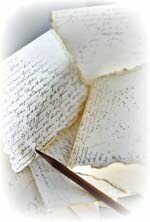 The Greeley Girls are wishing you great blessings for sharing the written word. 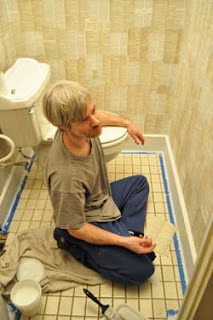 Wonderful job (doing and supervising) this bathroom makeover! I love it, and it does remind me of Rebecca's attic in that magazine feature. It's perfect for this small bathroom. Now you've got me inspired to work on my toilet closet (no kidding, previous owner put a toilet in a closet - no room for a sink!). The curtain is so fragile and feminine, is it vintage? Ah-hum. May I have some privacy here?...I need to close the door so I can look around, drool at the chandy and walls. I may be a while! That little bathroom looks wonderful! I love the chandelier and the lace on the window--the mirror is lovely too! Its beautiful. 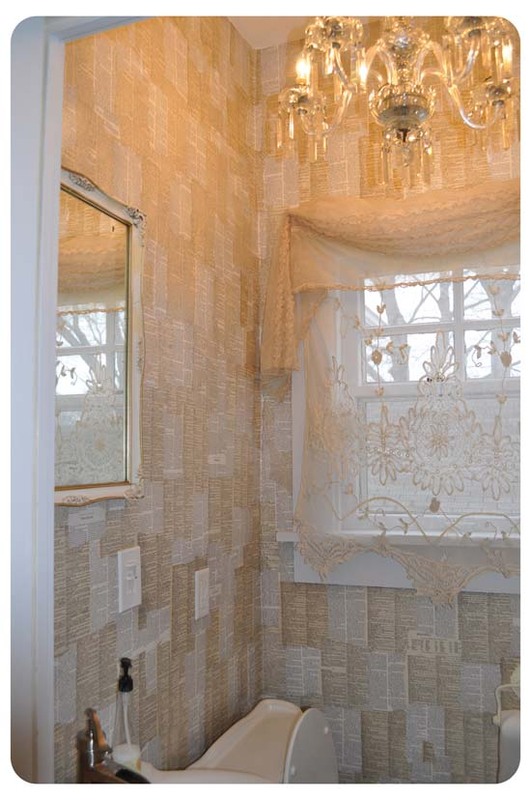 I tried to wallpaper a small bathroom with old hymnal pages once. It didn't turn out as well as yours. Great Job. I love what you did. I love the new look for the bathroom! And I adore book pages pasted on the walls! I've been wanting to do this in one of my rooms! Love it! I LOVE THIS!! I may have to do that in my teeny tiny bathroom...but not quite as small as yours. Or maybe just one wall. OMG Love it and I was just wondering if Steve makes house calls. I so wanting my bathroom to be as beautiful. 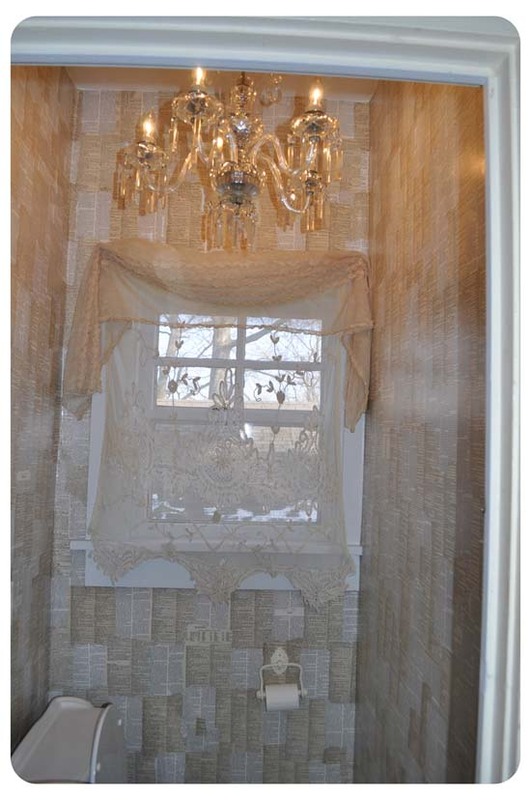 Your bathroom looks really beautiful: old books, linen and christal chandelier are all my passions! But please, can you explain me what clear coat is and how can it helps to better wipe down paper? Love how it turned out and no need for a magazine rack! LOL. Beautiful room. This is great and the Bible pages are genius! I may just have to do this in my bathroom:) Thank you for sharing your new 'reading room' with a new way to share The Gospel. I'm a new follower. Did I mention I love it. Awesome job! BOTH of you! LOVE the papers...they look so beautiful. And of course, you will find that your kids will remember different verses, but as they grow up there, you will find that those particular verses are probably their favorites! Wow! I have to catch my breath for a second! This is perfectly beautiful mostly because you have the Word of God written on your walls! You can't get any better than that. Enough said! I'm pinning it now and will feature this on Bella Nest next week. How awesome! I'm so happy to have ran across your blog. 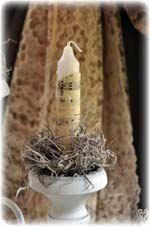 Blessings to you, my sister in the Lord!